Wednesday May 31st – Weaving Day in the shop with Fiona Nisbet. There will be different types of weaving looms set up in the shop for you to learn about and weave on. Suitable for beginner and novice weavers. Sunday 11th June – Basic Knitting Skills held in the shop. Suitable for beginners or returning knitters. We cover various methods of casting on, casting off, increasing and decreasing and demystifying knitting terminology. BYON – Bring your own needles. Saturday May 6th – Yarn Shop Day which is a special day supporting local yarn shops. Free patterns will be available including the Primavera Blanket which has been designed by Debbie Bliss exclusively for Yarn Shop Day. The pattern is only available from shops participating, so please come in and get your free copy. Lots of special offers on the day for yarns, knitting and crochet accessories, alpaca socks and felted gifts. The afternoon will use crocheting in the round to teach the basic crochet stitches – chain, slip stitch, double, treble and other stitches of different heights. Includes a ball of Stylecraft Special DK and crochet hook. Wednesday 25th January 10.30 – 2.30. Due to illness we had to cancel this workshop so have moved it to Wednesday 22nd February, instead of the weaving which we will reschedule to another date. Fiona Nisbet – a Shropshire based textile artist, designer and maker will be teaching you how to spin fleece with a Drop Spindle. All materials are provided and no prior experience is necessary. Light refreshments will be available throughout the workshop but please bring a packed lunch. Needle Felting – Learn how to make hearts and flowers with Fiona Nisbet. Fiona shows how to make hearts and flowers using a variety of colourful dyed fleeces. Light refreshments will be available throughout the workshop but please bring a pack lunch. See above for details of the workshop. If you are interested please contact us and we can put you on a waiting list either for a cancellation or for future workshops. Sara Robinson is a Shropshire based needle felting landscape artist. After having attained a BA in Fine Art and an MA in Art and Education she now specialises in creating beautiful landscape pictures taking her inspiration from the stunning Shropshire landscapes. This introduction workshop forms the foundation of the basic skills you will need if you are attending her follow-on Landscape Picture workshop. Sara will give you an understanding of how to build texture and depth within the medium to create artwork with greater dimension. Light refreshments will be available throughout the workshop but please bring a packed lunch with you. Sara will show you how to use texture and depth using a variety of natural fibres and felting skills to create your very own unique landscape masterpiece! Saturday November 12 – First year anniversary celebratory day at the shop 9 High Street, Church Stretton, SY6 6BU from 11am – 4pm. Friday November 25- ‘Black Friday’ in Church Stretton – lots of bargains & discounts in the shop! Knit & Natter to be held at the shop, 9 High Street Church Stretton from 4.30 – 6.30pm every Tuesday starting next Tuesday 15th November. Everyone welcome to come and knit or crochet and/or get help and inspiration. Sunday July 17th – Cancer Research Garden party at Essex Lodge, All Stretton. Taking 2 alpacas, Wizard & Derby, to support the event. Thursday 12th May – Spinning Workshop with Fiona Nisbet. Learn how to spin or become more proficient with your spinning! Fiona will bring different fibres to spin with and if you don’t have a spinning wheel there will be different ones to try. 10.30am – 3pm. Cost £65.00. Thursday April 28th – Inkle Loom Demonstration by Fiona Nisbet 10.30 am – 3pm. An Inkle loom is a small narrow loom used for weaving braids, belts, straps, shoelaces. Fiona will demonstrate how to warp the loom up and weave different types of braids etc. Saturday April 30th – Yarn Shop Day is to help promote local wool shops and is sponsored by The British Wool Marketing Board. Well known author, designer and knitting expert Val Pierce from Shrewsbury will be visiting the shop in the morning to inspire local knitters & crocheters and offer free tips & advice. Some of her published books will be available to buy. First 20 customers to arrive after 10.30 will receive free goody bags. Up to 40% off selected yarns bought on the day. 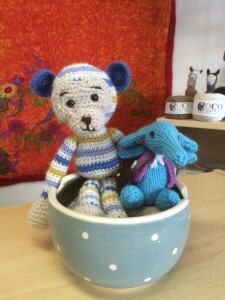 During the day complimentary knitting/crochet patterns will be available of a headband designed by Val Pierce made in Coco Alpaca wool, a brightly coloured crochet monkey and a knitted pocket size elephant! Throughout the day there will ongoing advice & tuition for beginners & accomplished knitters/crocheters. Please email jane@cocoalpacas.co.uk if interested in booking any of these sessions as places are limited to 4 places .